As more and more students join senior high schools, the student population in the more popular schools is increasing at a high rate. 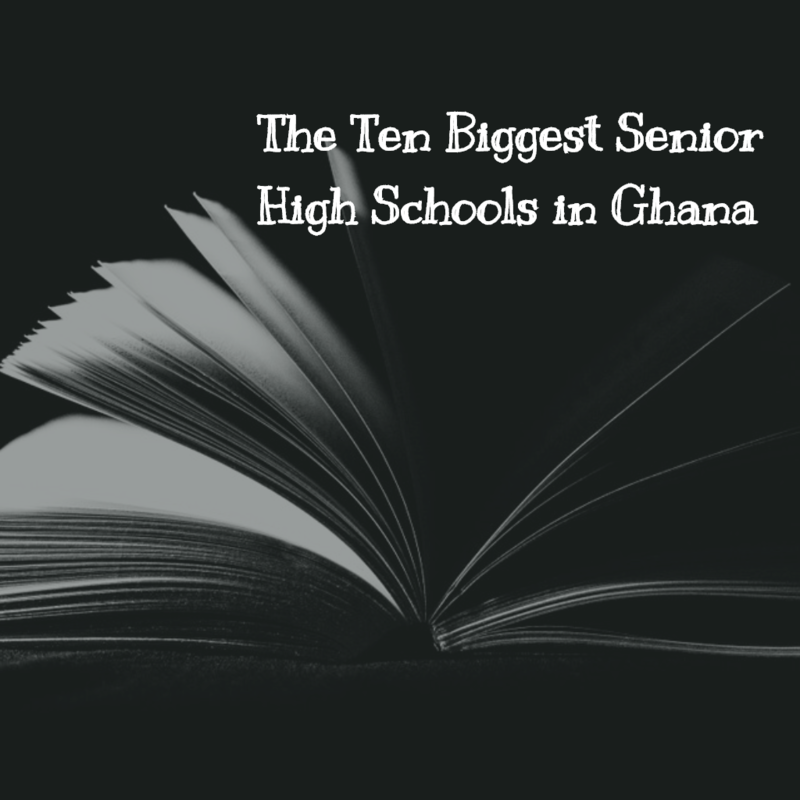 Below is a list of the biggest senior high schools in Ghana. Aburi Girls’ SHS, formerly known as Aburi Girls’ Secondary School, is also known as ABUGISS. This school is a Presbyterian all-girls senior high boarding school located south of Aburi in the Eastern region of Ghana. ABUGISS aims to be the greatest girls’ senior high school in Ghana and Africa, by maintaining high academic, moral and religious standards. Currently, the student population stands at 1800. Opoku Ware School, usually referred to as OWASS, is an all-boys senior high school with a population of approximately 1800 students, one of the biggest senior high schools in Ghana. This institution was established in 1952 and was named after the Asante King Opoku Ware 1. Students and alumni are known as Akatakiye – the Asante word for conquering heroes. With a student population of just about 2000, Adisadel College is another of the bigger senior high schools in Ghana. This institution was founded on January 4, 1910, by the Society for the Propagation of the Gospel (S.P.G. ), and assumed its current name in 1936. Adisadel College is located in the city of Cape Coast along the central coast of Ghana and has over the years produced alumni who have excelled in their professions and achieved greatness for Ghana. St. Augustine’s College is an all-male public institution located in Cape Coast, Ghana that boasts a student population of 2000. This college was founded in 1930 and was the first senior high school to be built on the Gold Coast. St. Augustine’s is the largest Catholic senior high school in Ghana, and aims to offer high-quality education to its students, as well as equip them for leadership in every aspect of life. Tutors at this institution are committed to providing excellent learning conditions in a strong Christian environment. This educational institution was founded on 20 July 1931 as a private school, and later became a government-assisted school in 1950. Accra Academy is a non-denominational day and boarding boys secondary school located in Bubuashie, close to Kaneshie in the Greater Accra Region. The student population currently stands at just above 2000. Currently, this academy is one of the few schools in Ghana that has 60% transition to tertiary institutions. Graduates of this academy are products of the dedication, discipline, devotion, and perseverance that form the foundation of this institution. Aggrey Memorial Senior School, with a student population of just about 2500, is one of the biggest senior high schools in Ghana. It was founded by the late Rev. Dr. A.W.E. Appiah in 1940 and started off with only six students. The school changed locations more than six times before it finally settled at Brafoyaw. Aggrey Memorial focuses on rigorously preparing its students to excel in the WASSCE yearly. Prempeh College was founded with the intention of filling the void in secondary education in the Ashanti region, and the Northern sector of Ghana. It began as a partnership between the Presbyterian and Methodist churches at the Gold Coast, the Kumasi Traditional Council and the Colonial Center government. The 2500 students of Prempeh College receive a unique educational experience that enables them to excel academically and occupy positions of responsibility in the outside world. Located in Cape Coast, Ghana, Ghana National College is a collaborative educational community that focuses on fostering academic achievement in a nurturing environment. This institution was founded by Dr. Kwame Nkrumah in 1948, and currently has a population of 2800 students. Ghana National College welcomes students from different ethnic, socio-economic and religious backgrounds and is committed to the equality of all persons before God. Achimota, fondly known as Motown, is a co-educational senior high boarding school located at Achimota in Accra, Ghana. It was founded in 1924 by Sir Frederick Gordon Guggisberg, the Rev. Alexander Garden Fraser, and Dr. James Emman Kwegyir Aggrey. This institution, with a student population of 3000, was previously known as Prince of Wales College and School, Achimota. This school, popularly referred to as PRESEC, is an all-boys school that was started by the Presbyterian Church of Ghana. It was founded in 1938 and moved to its present location – Legon – in 1965. PRESEC currently has a population of 3000 and is a force to reckon with in academics and sports. The list above indicating the biggest senior high schools in Ghana indicates that enrolment in secondary education is on the rise! As such, Ghana can now look forward to having a more educated and skilled workforce!